After flubbing their initial response to last September’s massive San Bruno pipeline explosion, utility Pacific Gas & Electric seemed to take responsibility for the accident, and even bought full-page ads in area newspapers proclaiming “We Apologize.” But in court filings this week, PG&E has backtracked, denying any blame for the deadly pipeline explosion and suggesting that other parties were at least partially responsible in order to dodge millions of dollars in damages from more than 100 lawsuits. PG&E claims aside, let’s look at the evidence that has surfaced over the past 9 months thanks to the work of Bay Area reporters and safety advocates. 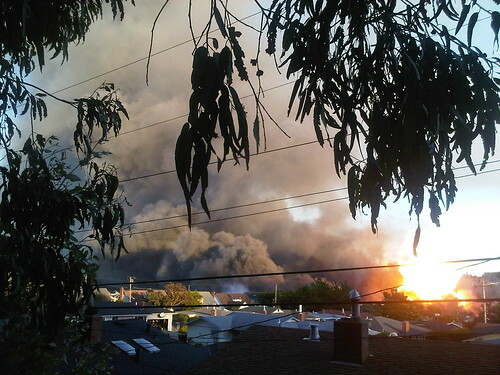 Between 2003 and 2010, PG&E increased pressure on gas pipelines in San Bruno to dangerous levels more than a dozen times, according to the San Francisco Chronicle. The line was pushed to the federal limit of 400 pounds per square inch in December 2003 and again in 2008. Safety advocates say the 10 other pipelines that underwent similar tests could be vulnerable to future explosions. The National Transportation Safey Board has repeatedly criticized PG&E for serious “record-keeping problems” which they say could lead to “potentially unsafe” pressure settings and even future pipeline explosions. In one example, PG&E initially claimed that the San Bruno pipeline in question had no ruptured seams, which was later proven false. UPDATE: PG&E is now claiming that it did not blame victims for last September’s pipeline explosion. “We want it to be crystal clear that no one at PG&E would suggest that the plaintiffs or residents of San Bruno impacted by this accident are somehow at fault,” the company said in a statement.